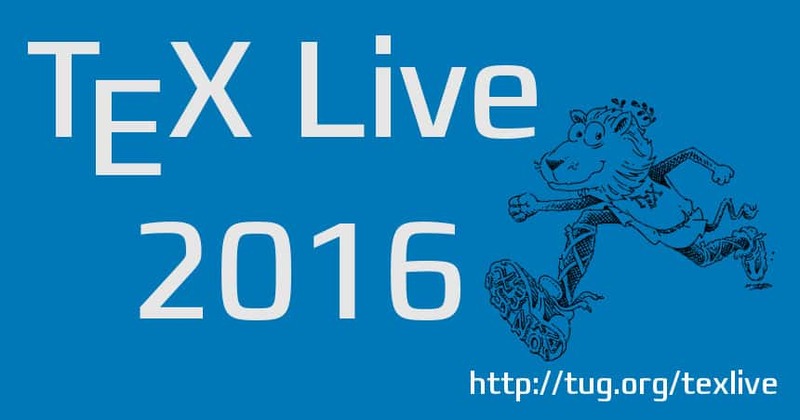 After long months of testing and waiting for the DVD production, we have released TeX Live 2016 today! LuaTeX is updated to 0.95 with a sweeping change of primitives. Most documents and classes need to be adapted! CTAN mirrors are working on getting the latest releases, but in a day or two all the servers should be updated. Thanks to all the developers, package writers, documentation writers, testers, and especially Karl Berry for his perfect organization. Now get the champagne and write some nice documents! Thanks for all your continued hard work keeping TeX up to date in Debian! Since I’ve whined on your blog in the past about non-technical stuff, I do want you to know I and others really appreciate your work. Thanks also to you for your comment! Thank you to all for the incredible work of maintaining , developing and enhancing/extending the beautiful TeX system . Best Regards to the entire TeX team ! Thanks NIck, as I said somewhere else, we need to thank the package and program developers for their incredible work!